Relics from history are not often something one is able to stumble across. For the most part, museums, governments and libraries take it upon themselves to safeguard these items. It is rare to see an important historical object outside of its protective case. There is the occasional exception to this rule. At times, the civilian collector, or family member, will be in possession of an item or memorabilia with an important tie to the past. In this case, the object and the owner often have an incredibly personal and sentimental tie. Recently at Framagraphic, we have been grateful for the opportunity to see, and work with, some of these unique items. 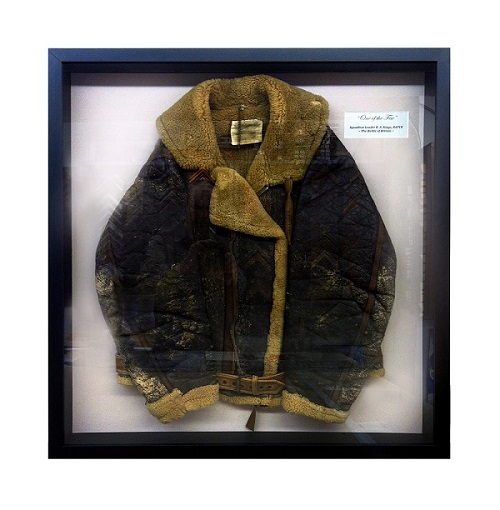 Our latest challenge has been a leather and sheepskin fighter pilot’s jacket, worn by an individual who was shot down three times in WWII, and survived. Far heavier than the usual jersey or t-shirt we are accustomed to framing, this jacket required some extra care. The jacket was secured in the frame with some inventive and specialized techniques. This custom-built object frame will play an important role in the conservation of this jacket, and Framagraphic is honoured and pleased to have been a part of this project. With Remembrance Day fast approaching, we invite anyone with medals, documents, photographs, garments or heirlooms to come to Framagraphic for a consultation. We would be happy to help you with the conservation of your artifacts, in remembrance of those individuals who have come before us. For more information on object framing, please click here.